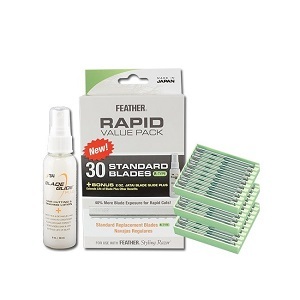 The Feather Rapid Value Pack contains 30 R-Type Blades and a bottle of 2oz. Blade Glide. The R-Type Blades work in conjunction with any Feather Styling Razor handle. R-Type Blades have 40% more blade exposure for rapid cuts! It's still the same safe, stainless steel guarded blade but it has less guard making it as close as you can get to a bare blade without getting hurt. With more rapid cutting, you can go through razor cuts with even less resistance and make your razor cuts that much faster. The Blade Glide is a haircutting lotion that aids in creating extra smooth cutting as the blade glides across the hair. It extends the life of the blade and has a mild scent.